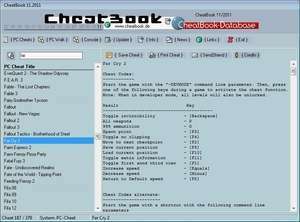 CheatBook (11/2011) - Issue November 2011 - A Cheat-Code Tracker with Hints, Tips, Tricks for several popular PC Action and Adventure Games. 379 PC Games, 7 Walkthroughs for PC and 28 Console Cheats are represented in this new version from Strategy Games, Adventure Games to Action Games. This Database represents all genres and focuses on recent releases. Games are listed alphabetically in the left-hand window. Version 02-2012 is a freeware program which does not have restrictions and it's free so it doesn't cost anything. For security reasons, you should also check out the CheatBook DataBase download at LO4D.com which includes virus and malware tests. Additional screenshots of this application download may be available, too. CheatBook DataBase download been highly rated by our users.